So when last we talked, 5 of us had gone to Stingray City and 2 had stayed in town to walk around Georgetown, Grand Cayman. We were supposed to meet up in town and walk around for a while, but since the Stingray City group took a side trip to Starfish Point, we missed our meeting time by a bunch! We finally found each other in the WindJammer for lunch, quickly decided that there was nothing we wanted there. Since we had worked up a huge appetite snorkeling, swimming with the rays and searching for starfish, we decided to go to Johnny Rockets for burgers…we should have skipped lunch entirely and just waited on dinner, but who could have predicted how much food would soon be in front of us?? As is fast becoming a habit, we donned pool clothes, put the kids in the play area and headed to Squeeze for tropical cocktails. Sanjay and Sirjohn were fast becoming familiar with us and usually had something for us to try every time we walked by the bar (this is one of the perks of having the drink package!). It was then time for our main event, dinner at Portofino’s. If you remember, we had a pretty underwhelming dinner at Chops earlier in the week, and our Main Dining Room experience had just started to be what we had expected based on past experience. We get the littles settled with movie and ice cream and 4 of us head up to Portofino’s. We were seated and introduced to our waiter, Patrick. I don’t think I am being overly generous when I say that Patrick is one of the best waiters I have ever had. Land or sea. He has that perfect combination of involved and out of the way, suggestive without being pushy, friendly and professional, and of course accommodating. I don’t recall what all we had, but I am pretty sure we had a bit of every menu item available. The one main course stand out is a dish called the Seafood Tower. It is delicious, of course, but the presentation is what makes it over the top impressive. 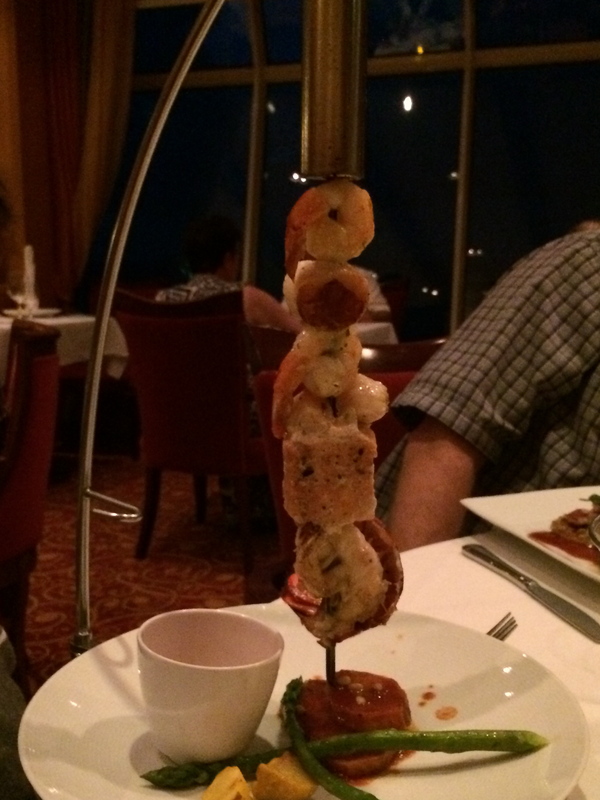 Shrimp, scallops, a full lobster tail all threaded onto a skewer and suspended over a plate with ahi tuna medallions, asparagus and roasted potatoes. Served, naturally, with drawn butter. Patrick expertly plated the dish and removed the lobster from the shell. This dish was pretty awesome! We all enjoyed it, but I am not sure that M was all that happy with us attacking his dinner!! Overall all the dishes were fantastic, but this was the only one I took a picture of…until dessert!! 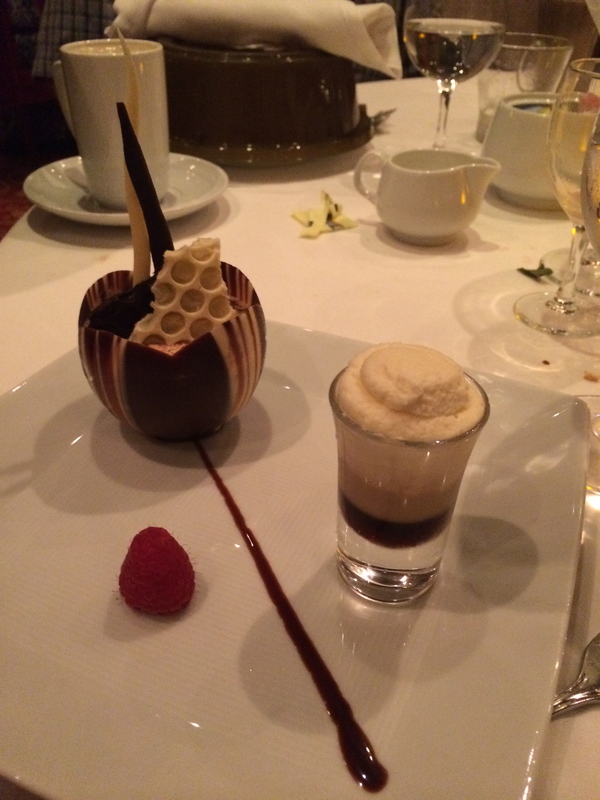 Dessert at Portofino’s is truly an experience not to be missed…you will be so full that you will swear you will burst, and then they offer the desserts and suddenly you have to try them all!! 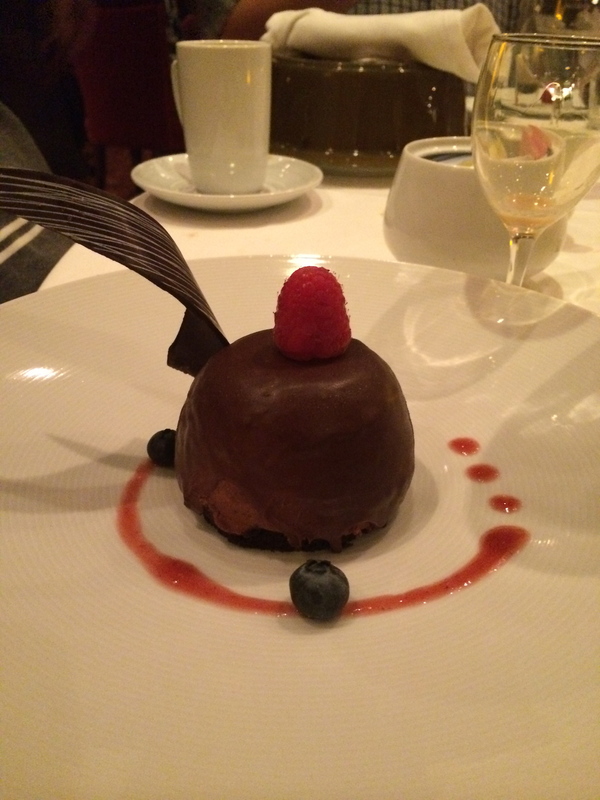 Maybe that is why Royal Caribbean did away with Portofino’s and replaced it with Giovanni’s Table…people were actually bursting trying to stuff in dessert! I will just let the pictures do the talking for me! 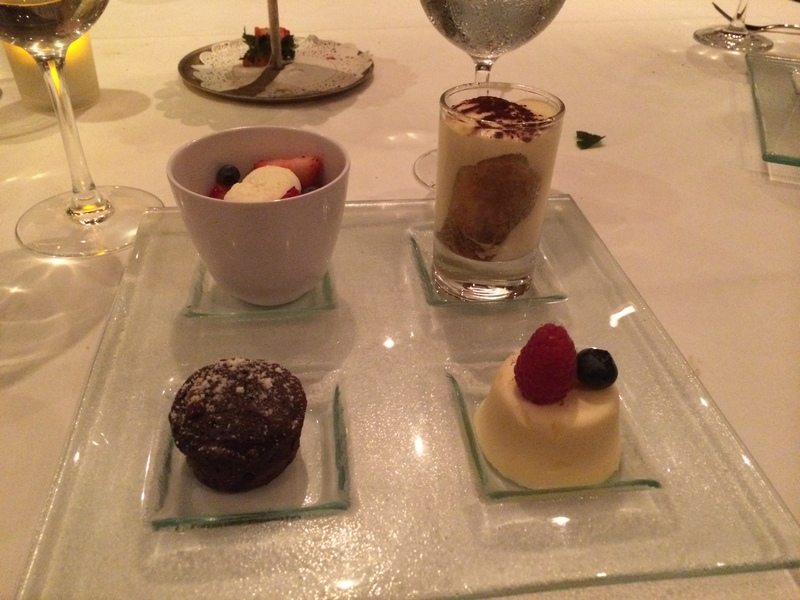 The sampler in the top picture is: berries and zabaglione, tiramisu, chocolate cake and cheesecake…all four were very tasty. The second picture is a chocolate bomb. A cookie on the bottom, chocolate mousse with a dark chocolate shell on top. Very good…very rich! The final picture is easily the best dessert I have ever had. It is a chocolate shell filled with tiramisu with a white chocolate crisp. In the shot glass was a sweet cream on top, a Bailey’s and Kaluha shot underneath. WHAT!!!! Where has this been all my life!!! I am not a big dessert eater, but this one was great! We decided immediately that we would have another dinner at Portofino’s on Saturday night. I have since been to the new Italian concept Giovanni’s Table, that has replaced all of the Portofino’s on board Royal Caribbean Ships. Its good, but its not Portofino’s. Add in service like we had with Patrick and this night remains one of my favorite dinners of the year! We then waddled down to the casino to make our nightly donation to the Royal Caribbean future ship fund, before rolling into bed to prepare for Cozumel in the morning. We have booked an all-inclusive day at Nachi Cochum…I am pretty sure I am skipping breakfast, up next is all you can eat Mexican food!